Red mold is not one particular type of mold. 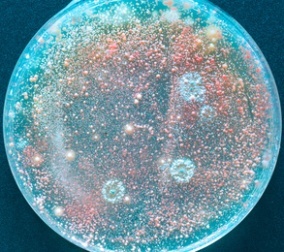 Several types of mold may be red in appearance, including aspergillus, fusarium, and rhodotorula. If you have mold in your home, identifying the type of mold is not usually essential. The priority is to remove the mold and prevent it from coming back. Mold is a common allergen, and can cause cold-like symptoms when you come in contact with airborne mold spores. People sensitive to or allergic to molds might experience sneezing, a runny nose, sore throat, itchiness, red irritated eyes, headaches, rashes and asthma-like symptoms like wheezing and a cough. Over time, exposure to the mold spores can cause a worsening of these symptoms. In rare cases, allergies aren’t the problem: fungal infections are. For people that have a compromised immune systems, or the very old or very young, red mold has been associated with some serious health conditions. For example, fusarium can cause a nail infection called onychomycosis or an infection of the cornea called keratomycosis. The mold aspergillus has been known to cause a serious infection called invasive aspergillosis. Symptoms of this disease include fever, a bad cough, shortness of breath, chest and joint pain, and headaches. Rhodotorula can cause a systemic fungal infection that is very difficult to treat. Infections may involve the respiratory system, intestines, or more. Even without these major infections, exposure to mold spores can cause problems even among healthy people. The only permanent relief from symptoms due to mold exposure is to remove the mold from your home. What Do You Do If You Have Red Mold? All mold in the home poses some degree of risk, both to your health and to the structure of your home. Mold can grow quickly in moist environments. You may see red mold in your bathroom, on food, or on parts of your home that have experienced water damage. Water damage can happen quickly due to floods, broken pipes or sewage backups, but even a slow, unseen leak in the basement can cause major damage. If you think you have red mold or any other type of mold growing in your home, you need to get rid of it as soon as possible. Be cautious before attempting any mold remediation work if you suffer from allergies, have respiratory or other health problems, or are at all concerned about your health due to mold exposure. We recommend you check with your doctor before undertaking any mold removal project. Wear rubber gloves and a N-99 mask to reduce your risk of coming into contact with mold spores. Throw away moldy food immediately, and clean your refrigerator to remove any mold spores that may have transferred to other surfaces. Never eat food that appears to have mold growing on it. Red mold on non-porous surfaces, like shower tiles or a sink in your bathroom, may also appear pink in color. You can clean mold on non-porous surfaces with a diluted bleach solution (1 cup bleach mixed in 1 gallon water) or other household disinfectant. Spray the cleaner generously over the moldy area and allow it to sit for a minute or two. Scrub with a rag or stiff brush, then wipe again with a clean damp rag and allow to air dry. Repeat if necessary. This same process can be used on any hard non-porous surface such as tile floors, kitchen counters and bathtubs. If you have mold on porous materials such as drywall or ceiling tiles, you will not be able to simply clean the mold itself, because most likely it has penetrated the porous surface. Porous materials with mold need to be removed and replaced. The US Environmental Protection Agency (EPA) recommends that if you have moldy areas greater than 10 square feet, that you not attempt to remove the mold yourself. For a job that large, the EPA recommends hiring a professional to remove the mold. For a smaller amount of mold, you may decide that you can handle the cleanup yourself. Follow this link to read our do-it-yourself mold removal guide. Materials such as carpet, upholstered furniture and mattresses are not able to be cleaned if they have red mold growing on them. They should be thrown away and replaced. Simple home maintenance can make a big difference in preventing red mold. Always clean up spills right away, and fix plumbing issues promptly. Ensure that your bathrooms and kitchen are vented to the outside and always run the fans during showers and while cooking so humidity doesn’t build up inside. When humidity levels are high like during summer, use a dehumidifier or air conditioner to keep indoor humidity levels between 30 and 50 percent. Check all windows for signs of condensation because moisture can easily get trapped which allows mold to grow. You may need to replace the window insulation or install new windows. If your mold problem is due to a great deal of water damage, covers more than 10 square feet, or if it was caused by contaminated water like a sewer backup, you should contact a professional. Also contact a mold removal professional if there is mold growing in your home’s HVAC (heating/ventilation/air conditioning) system. If you find or suspect that there is mold growing in your home, we recommend that you have a mold remediation specialist perform a home inspection. There is no charge for the home inspection, and they will help you identify areas of concern, and the cause of the mold. Follow this link for a list of local mold professionals in your area. If mold is found, you will get a free estimate for professional mold removal.